I wept because I had no shoes until I met a man who had no feet. Let today be a day of acceptance, compassion, and understanding. 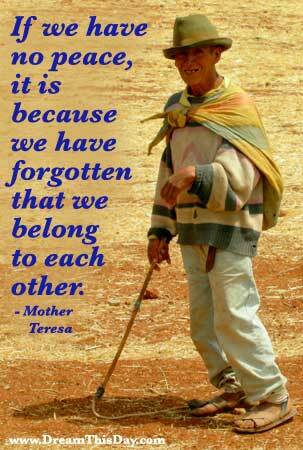 Let us feel our bond of humanity with each of our planet's six billion souls. and feel the throb of each human heart in your heart. be limited by your politics, your language, or your traditions. Today's Affirmation: I choose acceptance and compassion toward all humanity.